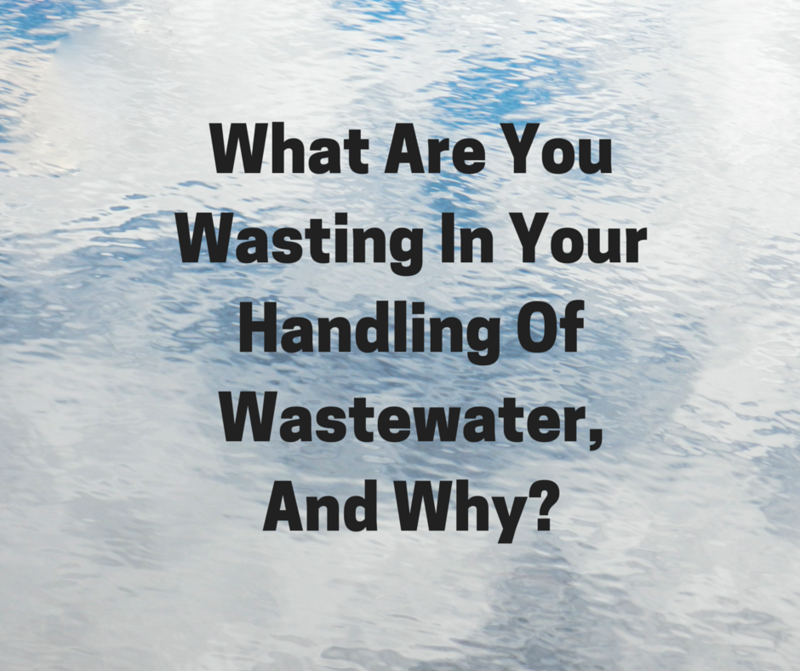 What Are You Wasting In Your Handling of Wastewater, And Why? C&B Equipment, INC.BLOGTips and TricksWhat Are You Wasting In Your Handling of Wastewater, And Why? A situation in which something valuable is not being used or is being used in a way that is not appropriate or effective. When someone defines something that you are doing and the definition is not particularly pleasant in your view, how does that make you feel? Do you just ignore it? (And hope that the feeling goes away!) Do you find some way to justify your actions or do you have some other excuse? Or could it be that “We’ve always done it this way” and hope that that what you answer or how you respond is “good enough” to get by? I can’t believe that someone who is licensed, degreed, trained, experienced or in a position of responsibility to their family, their boss, their clients, their community, and/or their ratepayers who would want to continue to waste the valuable assets or funds allocated to providing the most efficient method of moving wastewater today. It has come to this! This waste can end. For all these many years, wastewater (raw sewage) has been collected in wet wells located throughout municipalities. These wet wells are a source of foul odors in the neighborhoods caused by hydrogen sulfide (H₂S) gases. The electrical equipment corrodes and the steel pipes and iron fittings in these wet wells are crumbling due to the corrosive effects of the Hydrogen Sulfide, as is the concrete itself. Waste comes, and stays, and continues to come when replacing the equipment and the structure with the “same old thing.” No innovation and no sustainability. These wet wells are a collection source for all kinds of debris in addition to what is flushed down the toilets and other drains. The “disposable” wipes, the diapers, the cloths, clothing and whatever else can be forced down a toilet ends up in the wet well. Again, for all these many years, the same old submersible pumping system is expected to move the wastewater to the treatment plant. This same old submersible pumping system used to work before “flushables” were introduced and flushing became the way to dispose of the wipes and other hygienic products. There is now a heavy price being paid. It is the waste that comes from the many additional hours of labor needed to pull, unclog, clean, and maintain pumps. The waste that comes from the equipment needed and the continuing additional man-hours used to remove and haul the debris from the wet wells. These wastes can end. The same old submersible pumps are still being used as the manufacturers have tried to convince you that they have made enough changes to eliminate the problems. They have changed the way they want the bottom of the wet well shaped … without ever mentioning that they hope to ease the clogging problems. They have changed the shape of their impellers, claiming that that is the fix. The point is that you still have a system that has been used for almost 60 years with no innovation and no sustainability; you will still have a wet well to collect raw sewage and all the other debris. You still have the odors and the hydrogen sulfide gas and you will still be wasting time and energy to pull, clean, and maintain the same old submersible pumps as the waste continues. In our regulated industry, you must comply with the many standards that are promulgated by the federal government as well as meet what your state requires of you. There are directives, more guidelines, and more regulations yet to come. Time to study, educate, evaluate, train, test, and specify must be allocated. You will need to acquire the new additional added materials and equipment needed. Then you have to implement the new requirements and that, too, is necessary and costly. The hours and equipment used in cleaning and disposing of wet-well trash, unclogging pumps and hauling debris is also costly and very wasteful. Why are you still doing this? This does not have to be done any longer. Years ago, the Europeans solved these issues. A lift station pumping system was developed that no longer held raw sewage in a neighborhood, while emitting H₂S, collecting wipes and other debris, no longer required float switches, and waiting to reach a level for a pump down. Wet wells were no longer used or needed. These wet wells that draw down or pump down batch flows and place stress on the treatment plant biomass, the valves, and the piping system with the all or nothing actions. What used to be wet wells are now clean, dry, equipment rooms with stainless steel, sealed, pumping systems. The collection points for wipes, trash, and debris, the endless pump and station cleaning has become a thing of the past. There are no more odors or noxious H₂S present to create complaints, threaten maintenance employees, corrode electrical fittings, the iron and steel appurtenances, and even the concrete structure itself. As there currently is a lift station pumping system, available now, that is patented and proven with years of use that will end the waste that plagues every treatment processor in the United States, why do you want to continue with the same old thing? The solution to ending what you are wasting is being used in thousands of applications (over 1,100 in France alone). The DIP System, named for “direct inline pumping,” features pumps that automatically clean themselves, shred the trash, self-regulate the flow required, and can be managed with a smartphone, a tablet, or a desktop from anywhere at any time. Note I said “managed,” meaning that you can actually remotely adjust and change settings on the pumps, not just “monitor” like all the rest. Just count the trips you no longer have to make to the lift station. Count the savings from no longer having to clean the wet well. Develop and format the reports you want and need, print on demand, and just hand them to whoever requires them. Count all of the other things your maintenance personnel can now be doing when they don’t have to pull, clean and unclog pumps. I have been involved in the pump business that goes back almost 40 years. I have the enviable position to be able to replace the “old school” municipal submersible pump systems that are now outdated or that need to go. (I’m not saying that I’m outdated or need to go!) There is too much to be done to help the wastewater industry benefit from what our federal government calls for, “innovation and sustainability.” I say, innovation is already here, it just needs to be recognized. That’s why I try to communicate with as many persons who are responsible for moving wastewater as I can. I even wrote a book called “After the Flush” that is available on Amazon.